To be quite plain: there are far more than ten great beaches in Scotland. As we say elsewhere, you could put together ten great beaches from the Outer Hebrides alone. So treat the examples here just as a kind of cross-section of the kinds of beaches that you can discover. And, repeat, repeat - these are not in any order. There is no Number 1 beach! Fraserburgh beach, looking east round the bay to the village of Cairnbulg. As we prefer a no-nonsense, no axe-grinding, tell-it-like-it-is approach, I have to say that I have a reason for including this beach in particular: it features in some of my earliest childhood memories. But having said that, I can think of no other beach in Scotland with its special colour. In sun or even in poor light it seems to have a kind of orange hue - such a contrast to the whitish, ‘quartzy’ shades of places like, say, Cullen or Lunan Bay. This beach at the tip of the north-east corner of Scotland could be said to be off the beaten track. But it’s worth a visit. The beach at Roseisle, on the Findhorn side of Burghead, Moray. Trees and sand together is a characteristic of the beach at Roseisle on the Moray Firth, near Elgin. It’s a big beach, in Scottish terms, and curves away almost to a point where sea-spray and forest merge in the distance. There are walks and trails inland amidst the plantings, while on the tide-line there are sea-worn WWII defences such as pillboxes and concrete blocks tilted and angled after more than seven decades of battering by the waves. (Important elements of the D-Day landings were actually practiced along here.) All this adds to the atmosphere. There are also several points where you can access the beach, between Burghead and points westwards - though, strictly speaking, it’s actually southwards at first. That’s another thing about this beach. You’d think it should face north, like the other beaches along this part of the Moray Firth coast - but look at a map and you'll see how it curls round, all the way to Findhorn, so that much of it is facing west. The Sutors of Cromarty - the cliffs that guard the entrance to the old naval anchorage in the Cromarty Firth, are a landmark on the horizon, as are the long line of northern hills fading over the horizon - a feature here as well as at Covesea (see below). Covesea Skerries Lighthouse, by Lossiemouth, Moray. 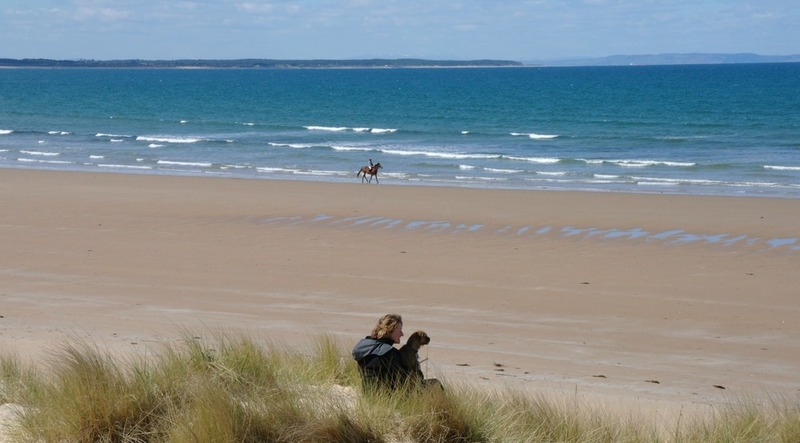 What, two beaches in Moray in the top ten? Start from the golf course west of the old fishing town of Lossiemouth on the Moray Firth (again!) or cut down to the beach near the lighthouse and you’ll arrive on a broad and breezy strand, with superb views across the Firth. If you walk for, oh, around half an hour or less, the beach ends with a coastal path rising along the cliffs - and on flat calm days the higher altitude gives even better views should the local resident Moray Firth dolphins turn up. On the east side of Lossiemouth there is an equally attractive beach. In short, the beaches hereabouts are superb. ( plus Lossie is a great place to get an ice cream too!) And that’s why there are two in our top ten list! Lunan Bay, Angus - another classic east-coast beach. A little bit nearer a conurbation, in this case, Dundee - though this beach isn’t far from Aberdeen either - and the beaches come under a bit more visitor pressure: walkways across the dunes, warning notices etc. 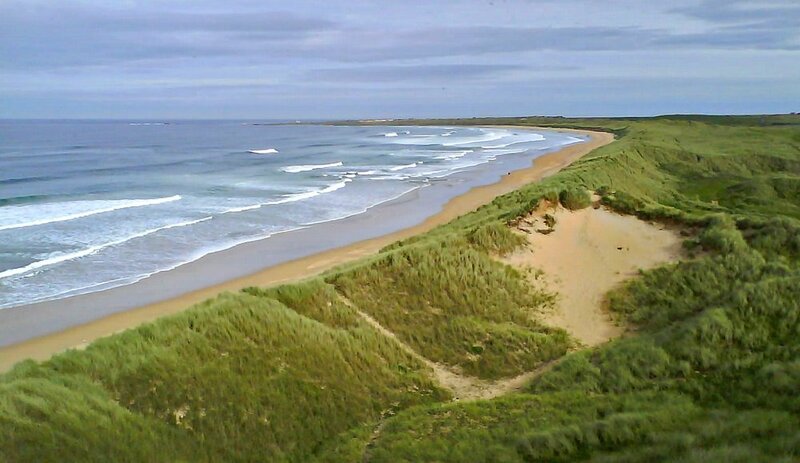 Nevertheless, Lunan Bay is another classic east coast beach, with pale sand backed by a thin line of dunes: plus an enterprising cafe, the Lunan Bay DIner, serving local produce. Well worth diverting from the main A90 to discover this one. (And I am trying to give a bit of a spread - otherwise all the east coast choices would be on the Moray Firth!) Tentsmuir in Fife near St Andrews should also get a mention. Traigh Sheileboist, sort of round the corner from Traigh Luskentyre, Harris. There are beaches and there are beaches. And then there are the beaches of the Outer Hebrides, especially Harris. And this particular traigh (Gaelic for sandy beach) is often illustrated in all its dazzling whiteness as a kind of byword for Outer Hebrides shores. Once a Harris beach - probably the endlessly-photographed Luskentyre - was even used in a brochure - they say - by tourism promoters in Thailand as an example of their tropical beaches. Mis-labelling in the photo library, perhaps. Just by way of a change, the picture here shows Traigh Sheileboist, which runs on to Luskentyre. No, the Outer Hebrides certainly aren’t tropical - but catch Scarasta, or Northton, or several others on a sunshiny June day and the quality of light, freshness, ‘unspoiltness’ and drama of these western shores are unbeatable. Walk over the dunes from Barra Airport terminal building to discover Traigh Eais. Traigh Eais, Isle of Barra. In fact, I had to put this one in as a reminder that it isn't just beaches on Harris that are spectacular. The vast cockle-strand, where the plane touches down - aka Barra Airport - on Traigh Mhor, is a shore with a difference. The difference is usually the aeroplane taxiing over it at low tide; but stroll west across the dunes from the terminal building and another beach appears - called Traigh Eais. It’s another sunglasses beach with very white sand. Oh, and then there are the beaches on Vatersay, joined by causeway to the south end of the Isle of Barra - they even have a ‘Three Beaches Walk’ there. On the north coast of Scotland, east of Thurso - and, with the north-westerlies blowing off the Atlantic, definitely feeling, well, just northern - the long curve of the sands here and the wind-carved dunes have a wild air about them. A beach discovered years ago by the surfing fraternity. Plenty of atmosphere, for sure. Worth taking in if you have time to kill, say, while waiting for the ferry to Orkney. Belhaven Bay, Dunbar. The tide is definitely out. Bass Rock offshore, centre, with the Berwick Law also on horizon, distant left. Less than an hour’s drive from Edinburgh and running out westwards from the town of Dunbar, the long open reaches of Belhaven Bay change with the tide and the season. To be frank, this fine stretch of coastline, part of the John Muir Country Park, would be even better if it was just a little further away from the town - that way fewer dog-walkers and joggers - and maybe not even the folk who exercise horses on a fragile salt-marsh behind the dunes - would be disturbing the wildlife. But, hey, we’ve all got to get along. This is a fine beach but you wouldn’t call it ‘undiscovered’. It makes it into this top ten selection in case you are just making a foray into Scotland only as far as, say, Edinburgh. (In which case - shame on you!). Anyway, the other interesting feature of the sands here is that the area is far enough away from the politicians of Westminster, London, England, for it to have a live bombing range on Garvie Island, offshore. Oh, whoopee. Entertainment guaranteed when the the military is on exercise. It’s still a lovely beach though. Yes, really. And for number 10 from a top beaches list...? I could make this twenty without even having to think hard. So, instead of mentioning just one more to make ten altogether, let’s have a wee round-up. Let’s have Strathy Bay, also on the north coast, remote Sandwood Bay in the north-west - that one is truly a stunner; next, Cullen and Sandend - two more on (my beloved) Moray Firth; then there’s Coldingham in the Scottish Borders near Eyemouth, very popular in summer...and all those sands that stretch for miles in north-east Scotland. And I’m kind of assuming you’ll hear about Tougal and the White Sands of Morar anyway when you’re here. Yes, for sure, Scotland has great beaches.